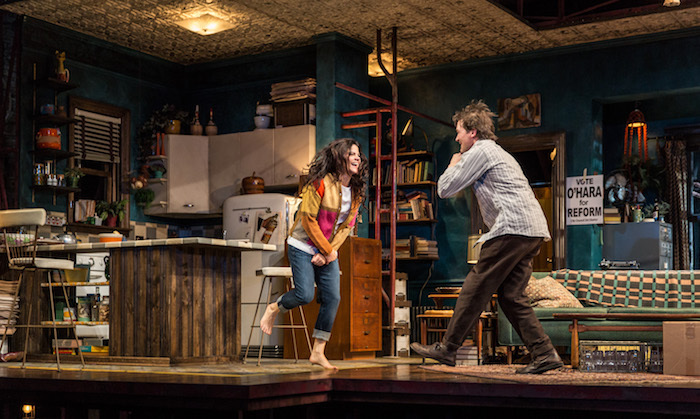 Goodman Theatre opened its Lorraine Hansberry Celebration Monday night with a new production of Hansberry’s last play, “The Sign in Sidney Brustein’s Window.” The play, first produced in 1964 with a three-month Broadway run, is a time-warp visit to 1960s Greenwich Village. Hansberry was concerned with the political issues and activism of the day, issues that still resonate: Political corruption, racism, homophobia, poverty and privilege. Sidney Brustein’s Greenwich Village apartment is the meeting place for a group of bohemians and activists. Sidney (Chris Stack) is the new owner of a weekly newspaper, in which he wants to celebrate his love for mankind, not deal in politics. After that first hesitation, he jumps in to what seems to be a pro-reform political campaign. The sign in his window is “Vote Reform,” followed by signs for “Vote O’Hara” as he supports Wally O’Hara (Guy Van Swearingen), who’s running for some important office, but it’s never clear what office it is. Iris (Diane Davis) gives a fine performance as Sidney’s wife, a waitress who yearns to be an actress but is frustrated because she never gets any good parts. She’s been in analysis for two years to help with her marriage and her career. Alton (Travis A. Knight), a writer-activist, and David (Grant James Varjas), a gay neighbor and playwright, are part of the entourage. Iris’ uptown sister, Mavis (Miriam Silverman) casts her disapproving eye on the whole scene in act one, then returns in act two for a nuanced, heartfelt scene with Sidney. Their other sister, Gloria (Kristen Magee), who has been working as a call girl, also plays a pivotal role in act two. Act one is a very long 105 minutes in which we meet the characters and their issues and listen to them talk, talk, talk. It’s a little pretentious. Sidney never misses a chance to throw in a literary or dramatic allusion. The actors don’t really seem to be in conversation, however. They talk like people who know they’re in a play, as my theater companion observed at intermission. Act two is more focused and effective than act one, but overall, The Sign in Sidney Brustein’s Window is not the play by which we want to remember Lorraine Hansberry. Anne Kauffman’s capable direction can’t save the script and her mostly competent cast doesn’t either. In addition to Davis’ performance, Silverman as Mavis and Varjas as the newly successful playwright David (his play about two men in a refrigerator is a hit) seem most like real characters we might want to get to know. Stack’s Sidney Brustein is a little forlorn and should pay more attention to his needy wife. He doesn’t seem really committed to the ideas that are tossed in the air throughout the almost-three-hour play. Hansberry’s last play had a short run on Broadway and hasn’t been produced very often since then. She died of cancer at 34 in January 1965, leaving several unfinished plays and other writings. I attended “The Sign in Sidney Brustein’s Window” wanting to love it, because of Hansberry’s masterpiece, “A Raisin in the Sun.” And because I have a sentimental fondness for the Greenwich Village of the 1960s, even though I missed Bob Dylan at the Café Wha? and wasn’t there to help Jane Jacobs in her preservation work. But ‘60s nostalgia doesn’t make the new Goodman production successful. The star of the show may be Kevin Depinet’s set design, with its apartment bathed in turquoise paint and the rooftop superstructure that allows us to see people coming and going and gives Sidney and Iris a place to sit and admire the nighttime skyline. Justin Townsend’s elegant lighting adds drama to every scene. Alison Siple’s costumes are particularly kicky for the female performers. This review was previously posted on thirdcoastreview.com.